In the heart of Bali, experience first hand the incredible surrounding landscapes from eight open-air overwater bungalows. 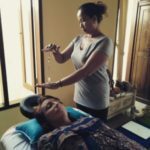 Immerse yourself in nature for a totally liberating experience. 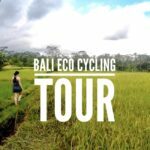 Surrounded by waterfalls, rice paddies, mountain streams and jungle food forests, each bungalow at Bali Eco Stay is your own mini sanctuary. 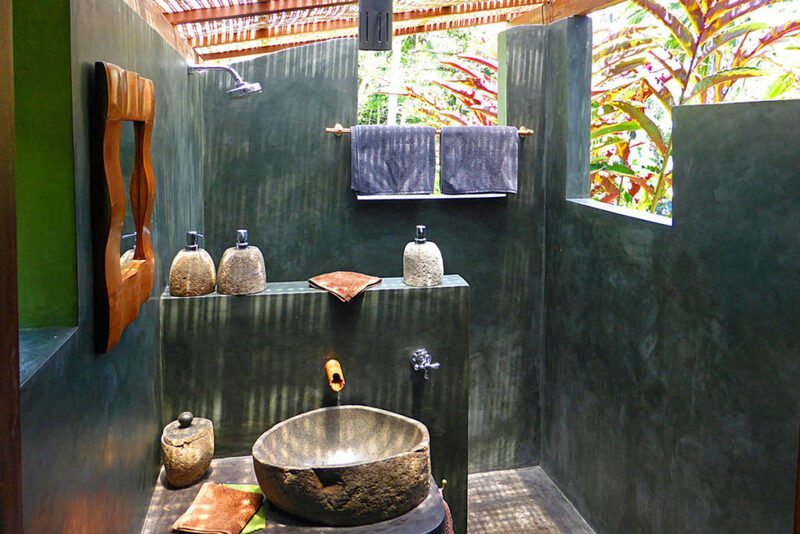 You have total privacy and comfort while being a stone-throw away from all the resort’s facilities. 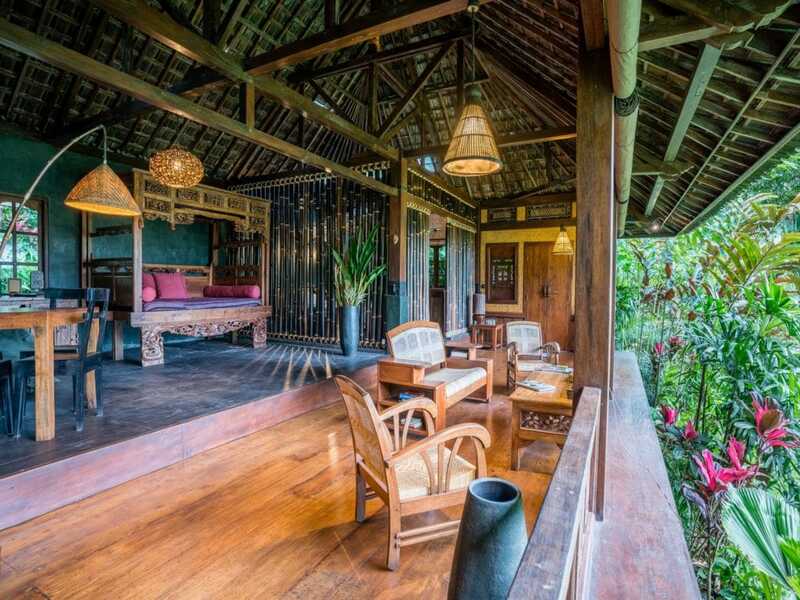 In keeping with Bali’s breathtaking natural beauty, our overwater bungalows have been specially designed using locally sourced materials that naturally blend into the mountain scenery. 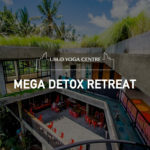 With open-air overwater bungalows, enjoy ever changing and vibrantly coloured views of rice paddies, mountain streams, food forests as far as the eye can reach and even the sea. 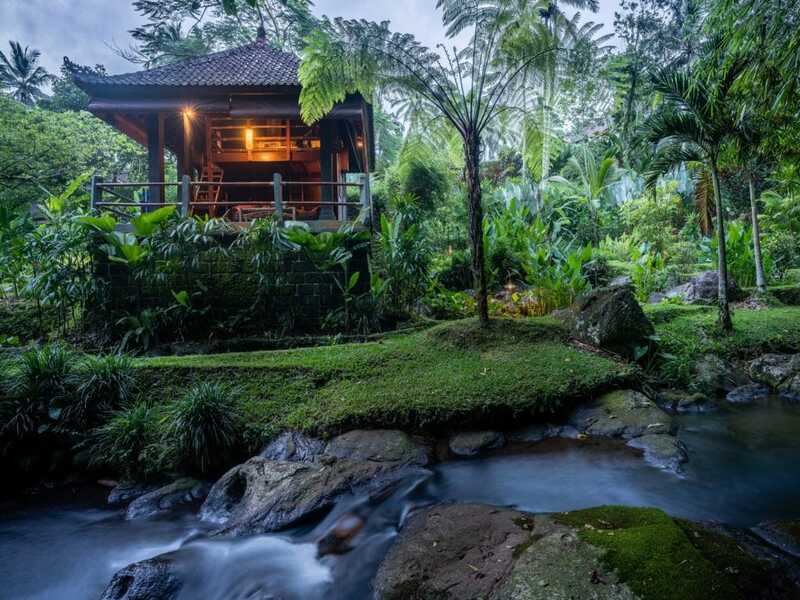 By night, drift to sleep to the soothing chorus of tropical jungle sounds and flowing water. 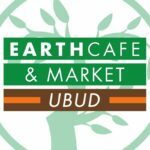 Indulge in organically grown food at Bali Eco Stay restaurant to rediscover the pure taste of fruits, vegetables, freshwater fish and pasture raised organic chicken. 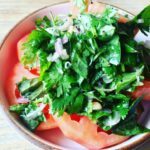 Enjoy bursting flavours of authentic Balinese home cooking prepared with love and respect for nature. Jungle playground for the curious at heart! 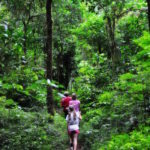 Get off the beaten track and forget about city life. 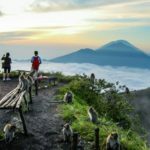 Lounge in freshwater rock pools, learn traditional crafts with our Kakek (grandfather), and explore untouched landscapes and villages either by foot, bike or scooter. 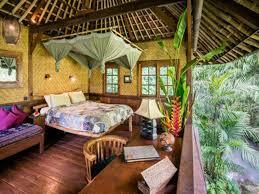 This spacious eco bungalow in the heart of Bali can sleep four people, and up to six if you need extra beds for children. 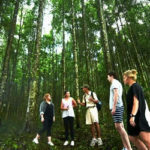 It is perfect for a family or friends wanting to visit the untouched landscapes of Bali. Equipped with two separate bedrooms, each with its own natural stone bathroom, and a large common area with two daybeds, you can relax with family and friends without compromising on privacy. The first bedroom is equipped with two single beds which can be adjusted to a king bed, while the second bedroom includes a queen bed. 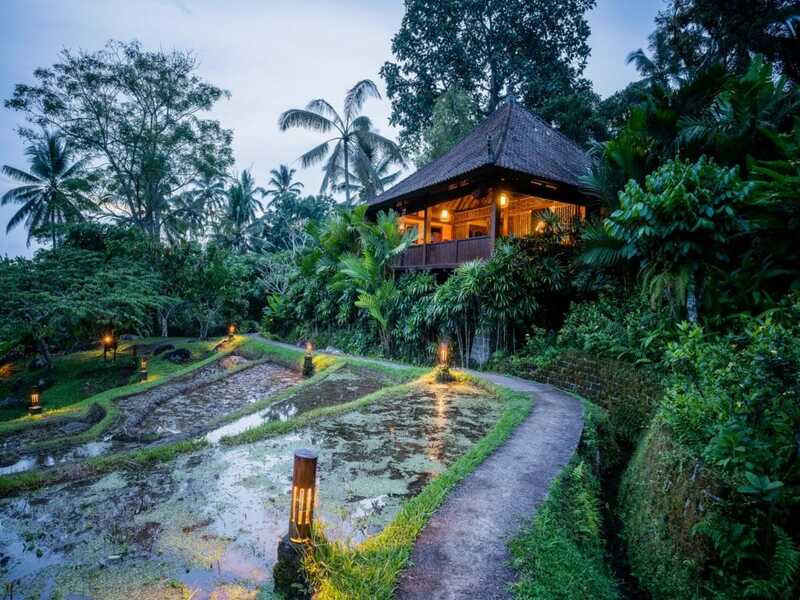 Being open-air with adjustable bamboo blinds, this eco bungalow provides expansive views of the surrounding rice paddies, where you are graced with a lightshow of fireflies and twinkling stars by night. 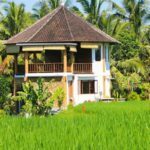 Enjoy numerous strolls through the rice fields and food forests of Bali directly from your bungalow, or relax with a book on private sun beds. 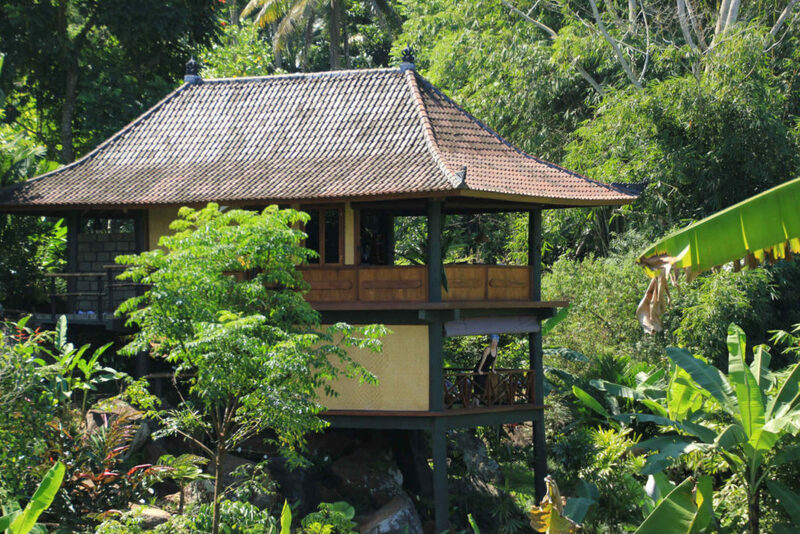 This incredibly spacious mountain accommodation in the heart of Bali can sleep up to six people. 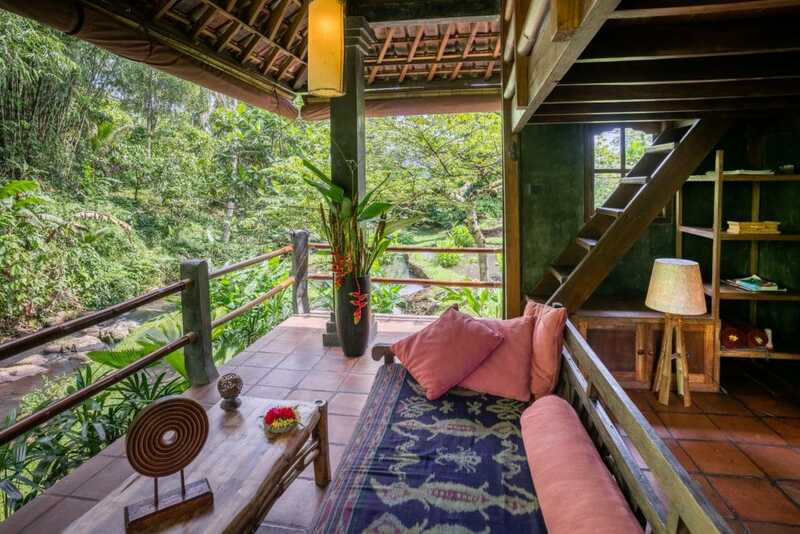 With direct access to our waterfall, this open air bungalow with adjustable bamboo blinds is perched on a hillside and split on two levels to maximise the cascading views of the waterfall and surrounding luscious green jungle. 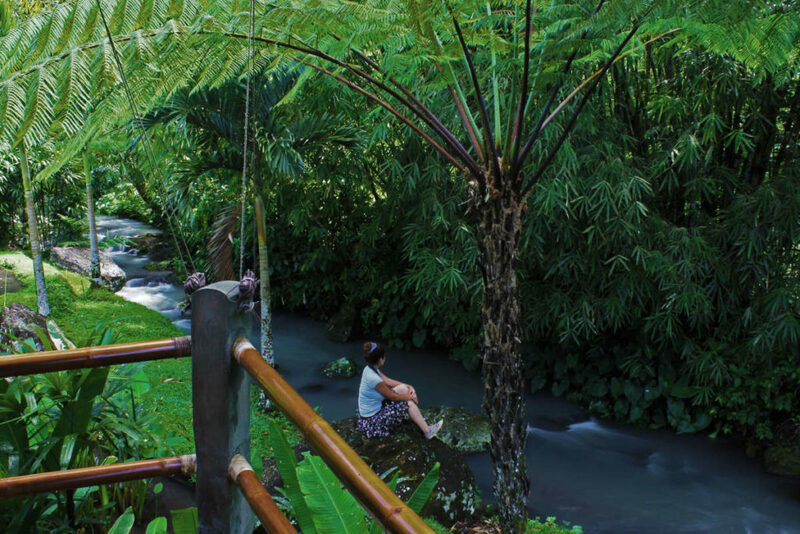 This is the perfect accommodation for families and friends who wish to experience nature in all its glory and relax to the chorus of rushing water. 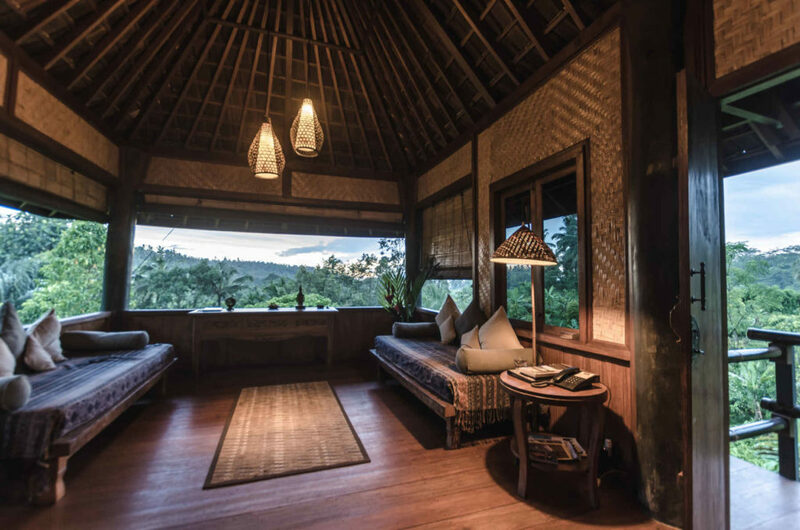 A large bedroom with lounge area occupies the first floor where you can enjoy sweeping views of nature all around you from the comfort of two daybeds. Enjoy restful sleep with a queen bed and be at one with nature in a beautiful open-air en-suite bathroom decorated with wild orchids. A second cosy lounge area is nestled on the ground floor, with two daybeds that can be converted to a second bedroom with two single beds or a king bed. 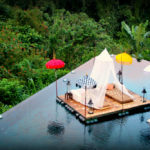 This spacious mountain accommodation is your own-perched kingdom in the heart of Bali with incredible panoramic views. 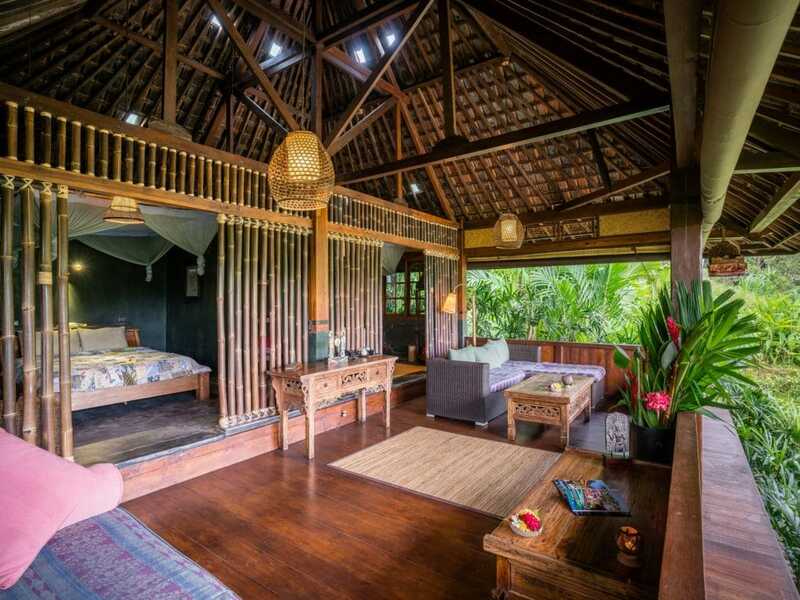 This spacious rice water bungalow in the heart of Bali can accommodate up to four people. 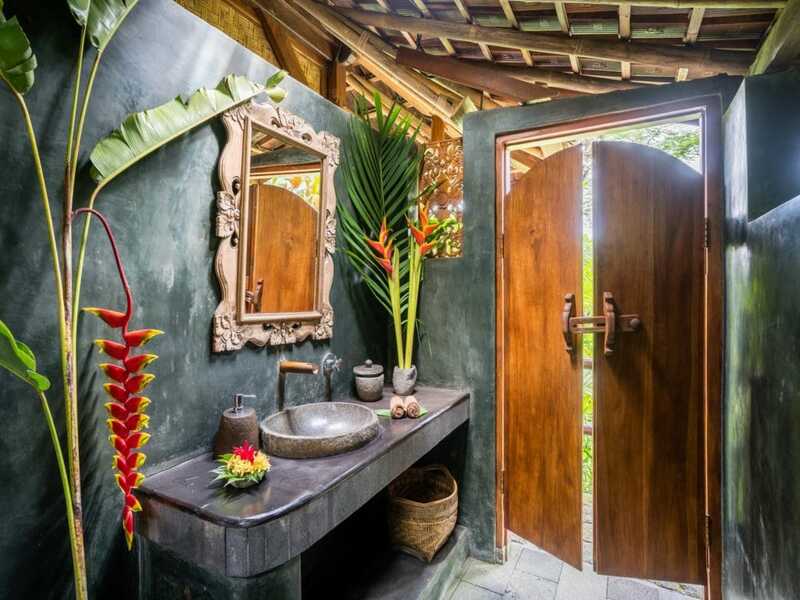 With two separate bedrooms, a shared jungle bathroom decorated with wild orchids and a large common area, you can relax with family or friends without compromising on privacy. 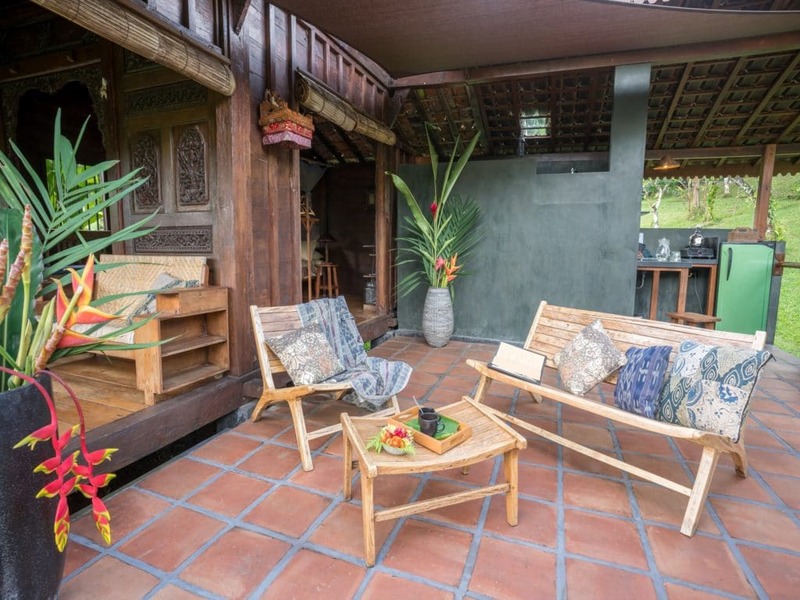 From the comfort of the lounge area, relax on two large daybeds while enjoying sweeping views of rice paddies, jungle food forests and even the distant view of the sea, or soak up some sun in the enclosed private garden. The first bedroom is equipped with a queen bed, while the second bedroom includes two single beds, which can be converted to a king bed. 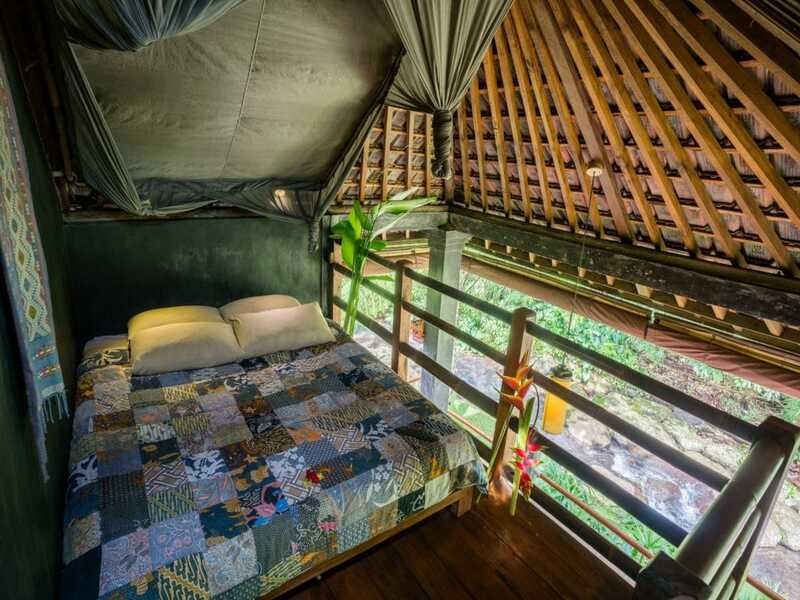 With adjustable bamboo blinds you have the choice to sleep under twinkling stars and the moon while being lulled to sleep to the chorus of rushing water and frogs. 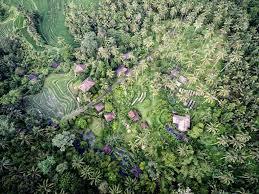 It’s the perfect accommodation for those wanting to experience untouched nature in central Bali. 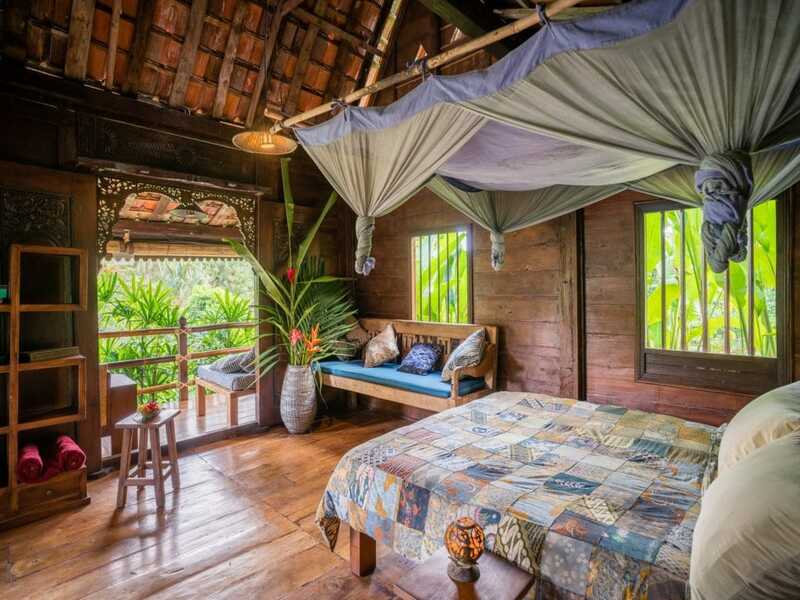 This cosy self-catering eco lodge is your home away from home in Bali. 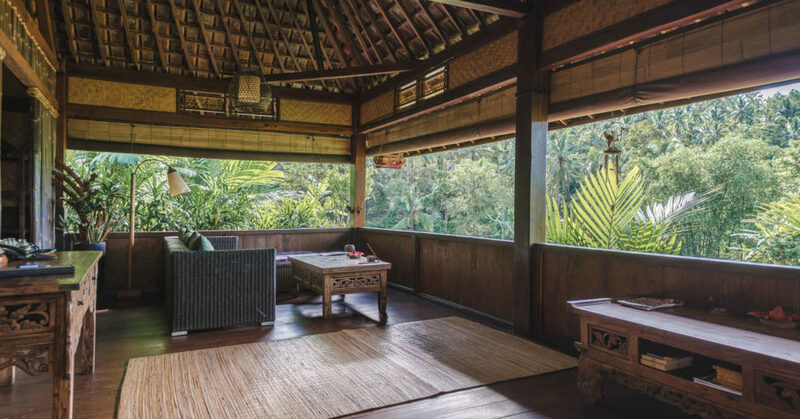 You will feel light years away from the stresses of everyday life with your own Javanese veranda, two spacious bedrooms and outside sitting terrace with en-suite kitchen. 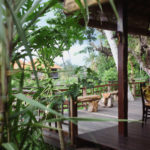 Roll up your bamboo blinds and soak up the surrounding views of tropical trees and food gardens from your daybed or outside terrace, and fall asleep to the chorus of crickets and frogs by night. 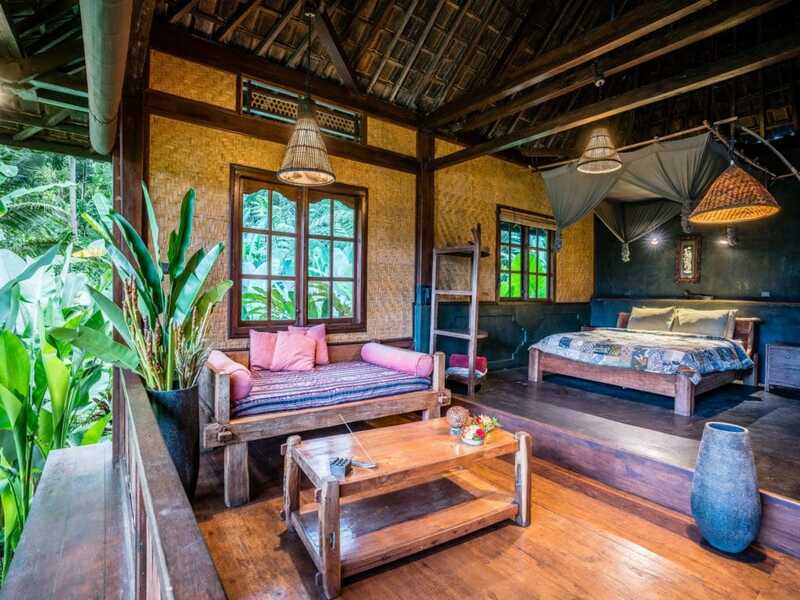 This eco lodge is split into two separate Javanese bungalows and can sleep up to four people. 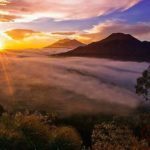 The main bungalow is equipped with a queen bed, lounge area and en-suite bathroom, while the second detached bungalow includes two single beds which can be converted to a queen bed. 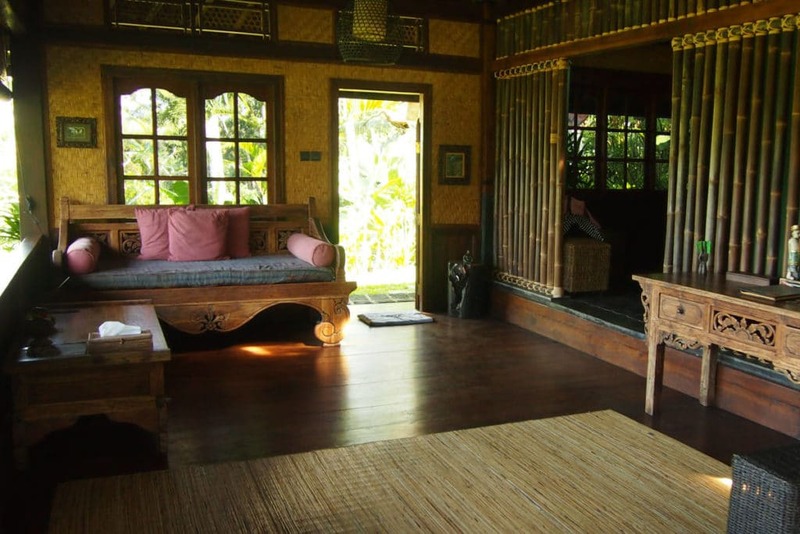 The main bungalow can be rented separately if required. The kitchen is self-sufficient with gas stove, surface for preparing food, crockery and a large bar fridge. 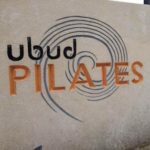 This open-living family accommodation in Bali is a beautifully spacious bungalow with adjustable bamboo blinds that can sleep up to five people. 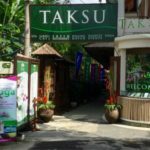 With sweeping views of the stream, fishponds and gardens, you are totally immersed in nature while also being in the comfort and privacy of your perched bungalow. 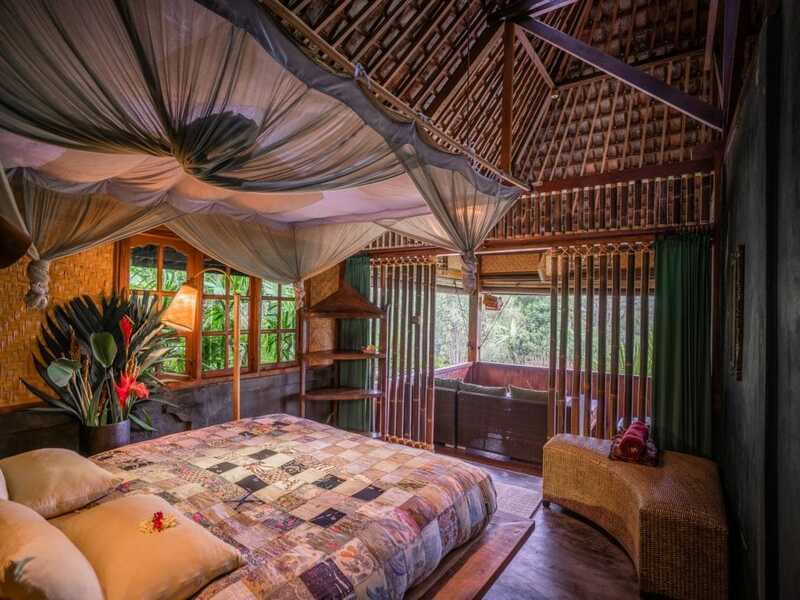 Split on two levels, the spacious master bedroom is on the top floor, equipped with queen bed and a daybed for lounging; with a second bedroom below offering a little sanctuary with private sitting area and two single beds that can be converted to a king bed. 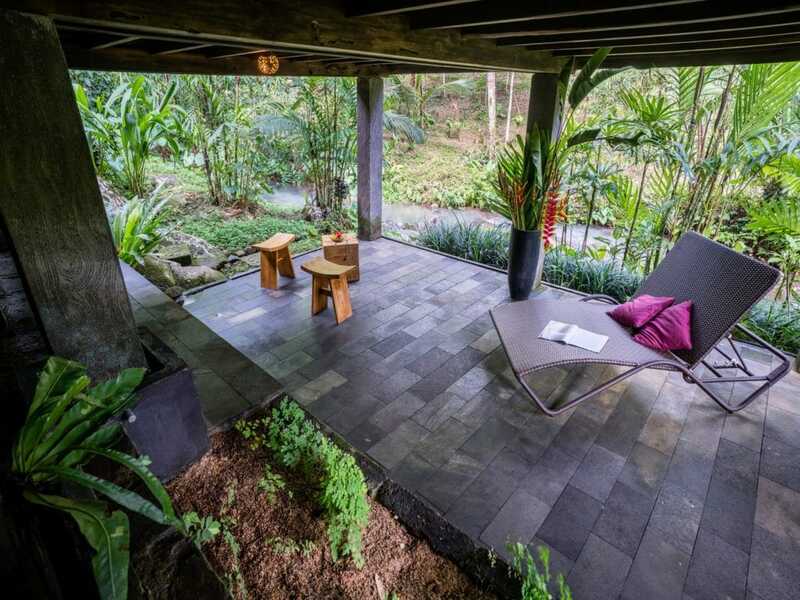 Soak up some sun or enjoy nature all around you with two outdoor sun beds. 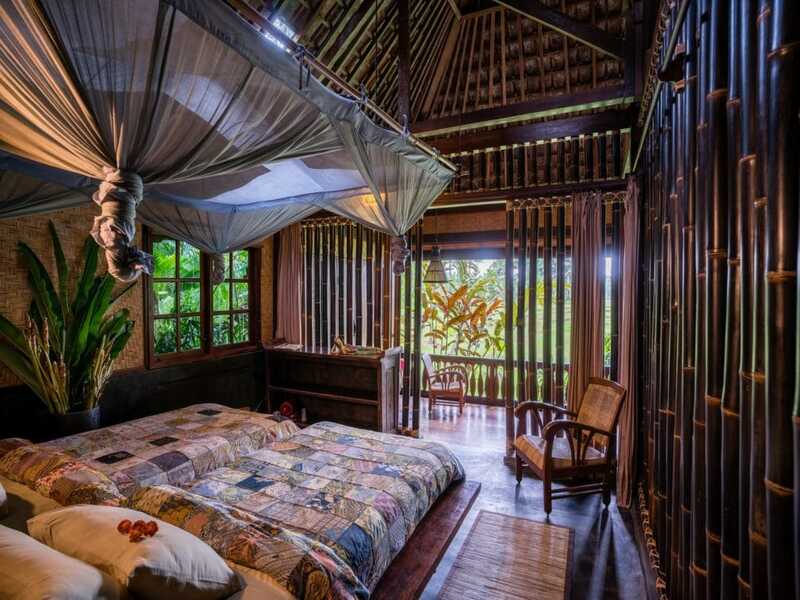 This magical treehouse bungalow in Bali is split on two levels with adjustable bamboo blinds and can sleep up to two people. 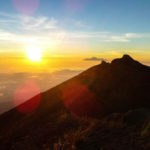 You will be graced with one of the most beautiful views you will ever see in Bali. 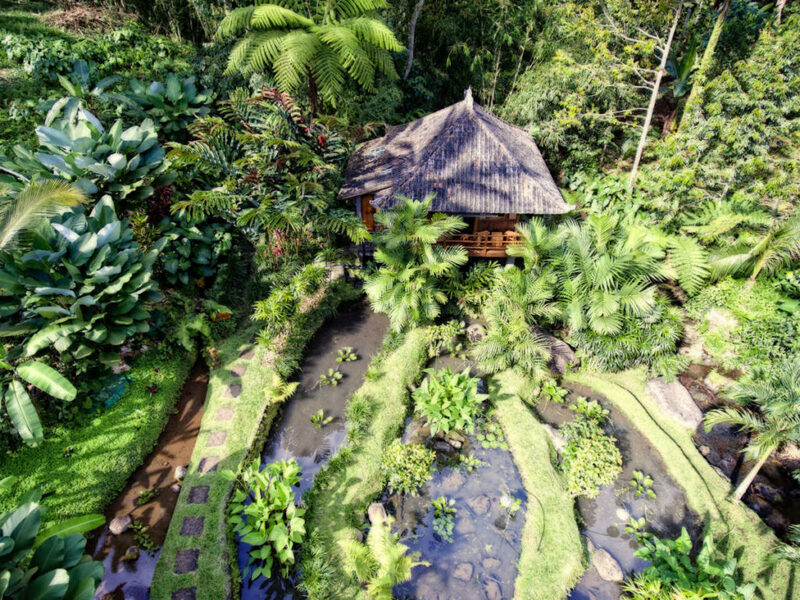 Perched on its hillside, this bungalow offers panoramic and ever-changing vistas of our jungle food forest and rice paddies. This is a view you will never forget and which you can enjoy for hours from your private daybed. 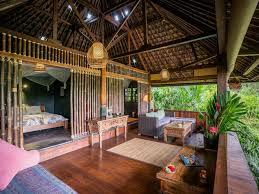 The bedroom is equipped with a queen bed and lounge area with daybed. 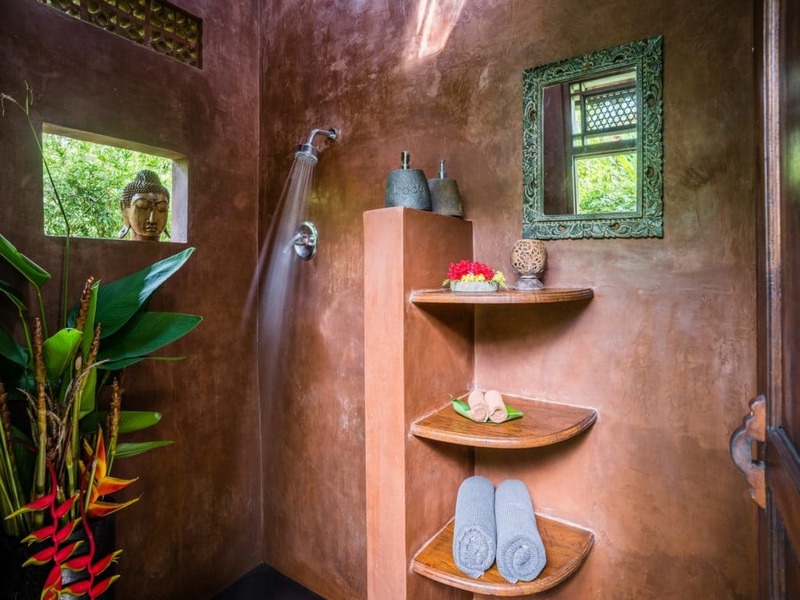 A spacious and romantic bathroom is positioned below the bungalow with its own little tropical garden, and two private sun beds for some downtime and sun bathing. 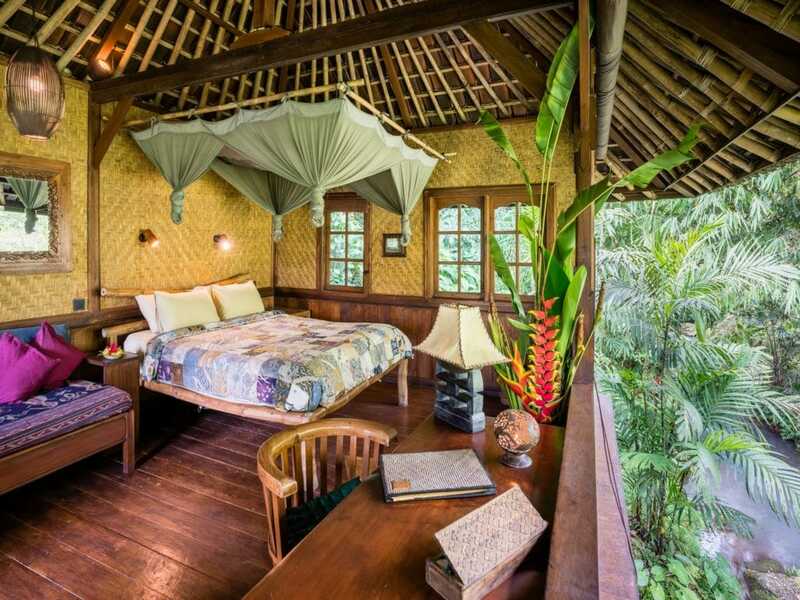 This treehouse bungalow is perfect for couples or singles wanting to experience untouched nature in Bali or for yoga and meditation retreats. 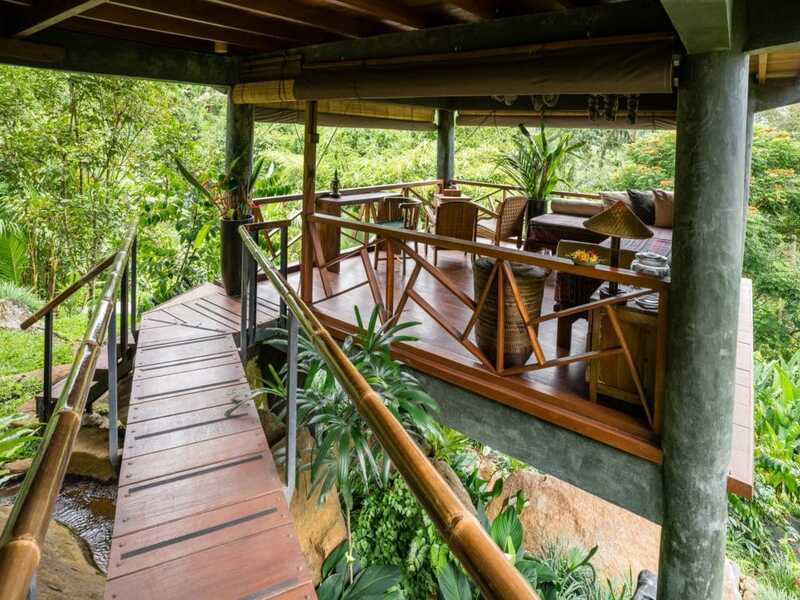 With private views overlooking the mountain stream and surrounding food forests, this overwater bungalow is tucked away in its own little jungle paradise for total relaxation. 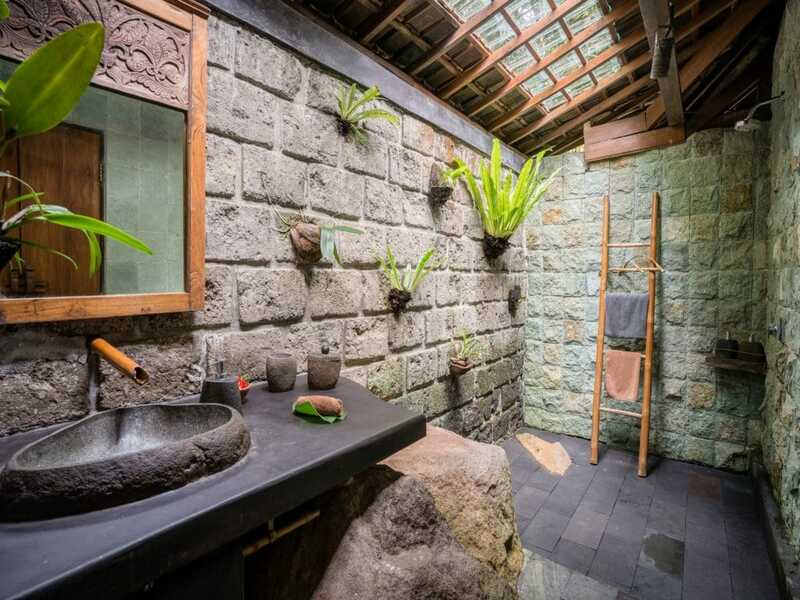 It can accommodate up to two people, and is perfect for couples or singles exploring central Bali. High season period: July 1 – 31, September 1 – 15, Easter Week & Chinese New Year. 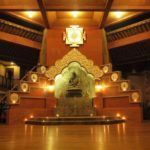 Peak season period: August 1 – 31 & December 1 – January 8. 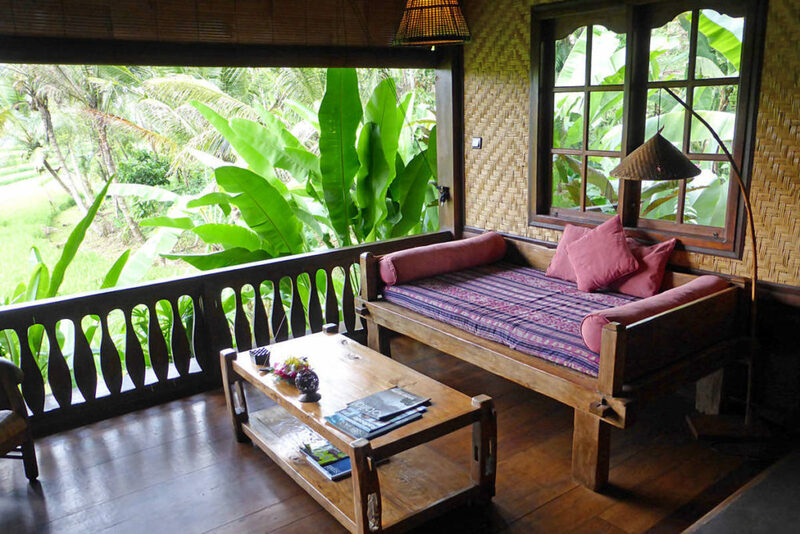 Minimum stay: LOW season: 5 nights; HIGH season: 5 nights; PEAK season: 5 nights.